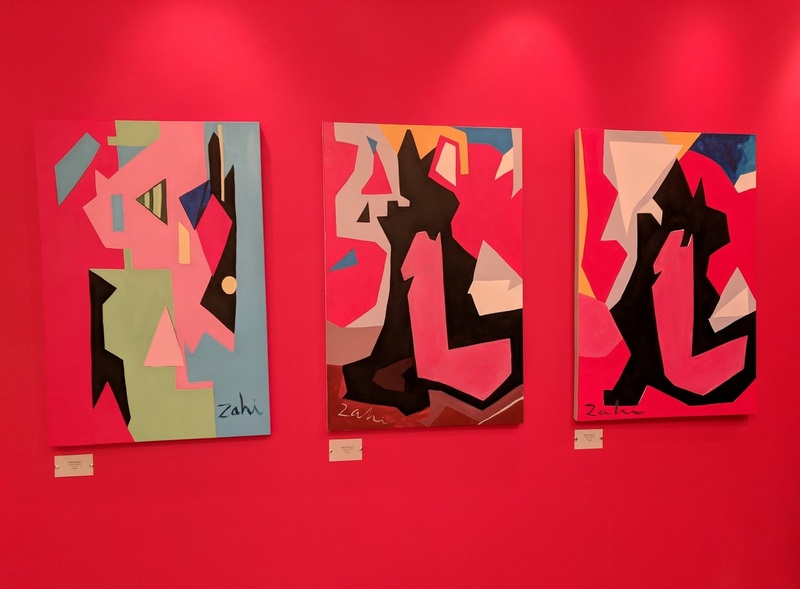 The latest iteration of the red wall, with paintings by Zahi Khamis. 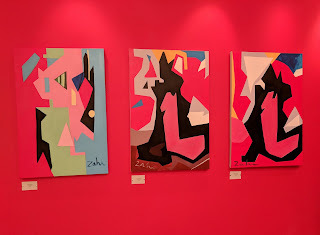 As a curator, I am sensitive to color, as the red wall in my gallery (even mentioned in The Washington Post) attests. In my personal life, I go with black most of the time, but when asked, I always say my favorite color is red. Choice of color can be seen as an aggressive act, wearing all black is sometimes interpreted as sinister, the choice of a rebel (black motorcycle jackets being an emblem of “rebel cool” in American culture). Others see it as simply chic (the famous “black uniform” of New York women). It can also be practical, as is mentioned in a book about poor women living in Cairo. Women of all classes in the neighborhood chose to wear black garments (sometimes covering a more colorful one underneath). This makes it possible to “level the playing field” of fashion, as cheaper materials can be perceived to be as chic as expensive fabrics, at least from a distance. Economically, black is a leveler in other ways, as a soiled black garment is less noticeable than a soiled light one, helpful to those with limited laundry options. But in many ways, the background becomes the foreground, in art and in life. We all make choices in how to present ourselves to the world, whether in clothing or in art. Color provides non-verbal cues to our emotions, or sense of self, and the messages we wish to impart. So, if black is your happy place, good for you. And if you choose to splatter rainbow hues like Jackson Pollack, hurrah. The philosopher Marshal Macluhan (anyone remember him?) famously said, “The medium is the message.” So, artists, loud and proud, full spectrum, or black or red (or maybe black with red socks—the choice of one of my favorite artists. And the inspiration for this piece).